Truelove has a small alumnae group from Wake County that gather often and she enjoys the time spent with each of them. "As I get older I have nurtured these friendships and I am stronger now because of it," says Truelove. "The sisterhood that you feel as a student is even stronger after you graduate and I value that." Truelove understands the importance of having strong women in your life. She and her sister Rebecca Michelle Scott Galloway, ʼ79, have always supported each other and had a special bond. "My sister is a great friend, teacher, and a strong lady who I admire and I am so happy we both attended Meredith. I like to think I had a little influence on her decision," says Truelove. Truelove always makes time to see her Meredith sisters in between travel time with her husband. The Trueloves have been proud owners of several sailboats and trawlers and currently enjoy cruising on small ships giving them ample opportunity to explore ports around the world. Having returned from the Baltics, they look forward to exploring Asia in 2020. The life that she has experienced has been very fulfilling. That's part of what lead the Trueloves to decide they wanted to give future young women the opportunity to experience Meredith. A scholarship could led them to another phase of their life journey to a place that fosters growth, friendships, and excellent educational opportunities. In 2017, they included a deferred gift to Meredith in their will. "Our planned gift will benefit someone with a Human Environmental Science major, the same major I had, because I know how beneficial that is," said Truelove. "My parents afforded me the opportunity to attend and this gift will give future students the chance to attend Meredith. It is important for me to pay it forward." Truelove was a home economics major and she credits a high school teacher, the 4-H Club, and her mother, who made beautiful clothes and taught her how to sew, in influencing her major at Meredith. While attending Meredith, Marilyn Stuber, Ruby Miller, and Kay Freidrich were the professors who gave her support and encouragement. In Dr. Stuber's class, with her support, she entered items into the State Fair in hope of winning money to buy her supplies for the next semester. "We had a full wardrobe when we graduated having made tailored coats, pants, suits, and dresses. I would take the bus on Hillsborough Street to the Belk department store downtown, so I could sketch and get ideas for my flat patterns class." That experience gained at Meredith actually led Truelove to her first job with Belk in downtown Raleigh, where she was on the sales floor and then moved to the buying office. For 17 years she worked as a women's sportswear buyer and traveled extensively to markets New York City and Los Angeles. Then in 1992, she formed a partnership to open Cameron Clothing Company. A year later she decided to take a completely different path and went back to school at NC State to get a certification to teach marketing in public schools. This allowed her more flexibility to travel with her husband, who spent his 31 year career as a industrial insulation business owner. 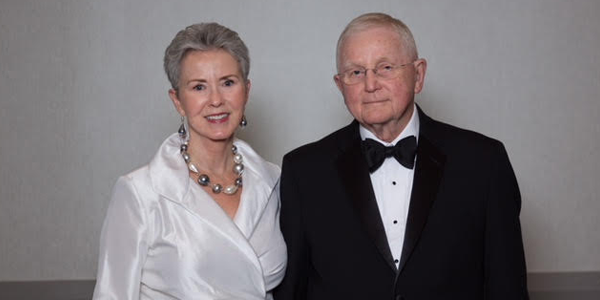 The Trueloves' partnership in all aspects from travel to philanthropy has enabled them to give to Meredith for many years and for that the College is extremely grateful. "Meredith women are my family. The support we give each other is incredible and important and Jerry and I are pleased to help a future Meredith student attend this wonderful College," said Truelove.